Change the way you control light at home with the Philips Hue Bridge. 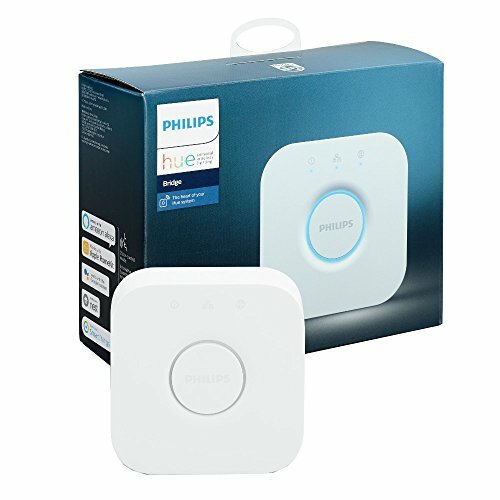 Add up to 50 Philips Hue lights of your choice with this ZigBee-controlled bridge necessary for voice control with Alexa, Apple HomeKit, or Google Assistant. The heart of your Philips Hue system, this bridge also enables you to control all of your Philips Hue products via the Philips Hue app, even when you're away from home. Enhance your Philips Hue system by setting timers and alarms, connecting to a variety of apps, dimming the lights and more (cannot be used with conventional dimmers). Easily expand your lighting system with accessories (sold separately), such as a Hue Dimmer Switch, Hue Tap, or Hue Motion Sensor. Pair it for automation with your existing Nest or SmartThings system. Control your lights by connecting the Hue Bridge to your router with the included ethernet network cable. This box also includes one Philips Hue Bridge, power adapter, manual, and two-year warranty.